We know fresh concrete becomes stiff with time. But it should keep in mind that stiffening and setting of cement are not same term. We have already discussed about stiffening rate of concrete. Workability depends on many factors like aggregate size, shape and grading, presence of admixture and air-entraining agent etc. But water is the main factor that offer workability to a fresh mix. Some water is absorbed by unsaturated aggregate, if have any. Some fraction is lost due to evaporation, especially when fresh mix is discharged or placed under sun or exposed to wind. Some water is required to take place early chemical reactions. a. A higher workability of concrete mix results greater loss of slump. b. A richer mix will result greater loss of slump with time. 1. Slump loss will be higher when cement has high alkali content. 2. Slump loss will be higher when sulfate content of cement is very low. d. Variation of workability depends on moisture content of aggregate for given water content of the mix as a whole. The loss of workability will be more when dry aggregate is used (due to more absorption); of course, incorporation of dry aggregate is intentional and desired water content is found from mix design. e. Water-reducing admixtures often results somewhat more slump loss with time, though initially they delay stiffing of concrete. 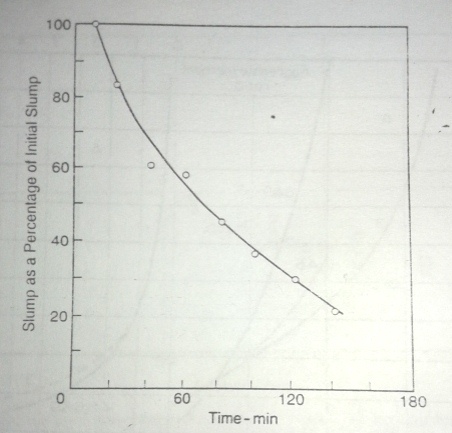 Above figure shows relation between slump loss and time for water/cement ratio of 0.4, alkali content of cement is 0.58.